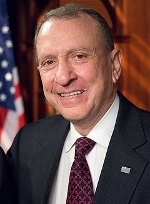 There’s a lot of hoopla being raised over the fact that Senator Arlen Specter (R-PA) has said that he will switch his party affiliation from Republican to Democrat and will run for reelection as a Democrat in the 2010 Senate election. Republicans are angered over Specter’s perceived betrayal and Democrats are crowing over it. Both of these groups are focused on the fact that Specter’s turning coat could, if and when Al Franken is ever seated, give the Democrats the 60 votes they need to break any Republican filibuster. Obviously the Democrats are crowing and braying over this. They’re eager to have total and unrestricted – they think – control over the Senate. Equally obviously the Republicans are moaning and gnashing their teeth over the thought of being effectively stripped of much of their voice. Both Parties and their supporters are acting like idiots! Sen. Specter is not ideologically not aligned on many core issues with the Liberals who have taken control of the Democratic Party.� There is no proof, nor even enough evidence to support their hope, that he would add his vote to the 60 needed to break a filibuster on those issues irrespective of his new Party affiliation. My change in party affiliation does not mean that I will be a party-line voter any more for the Democrats that I have been for the Republicans. Unlike Senator Jeffords� switch which changed party control, I will not be an automatic 60th vote for cloture. For example, my position on Employees Free Choice (Card Check) will not change. By the same token Sen. Specter is, and has been for some time, a RINO. There is no proof, nor even enough evidence to support their hope, that he would not add his vote to the 60 needed to break a filibuster on those issues irrespective of his current and soon to be ex- Party affiliation. Finally, this whole thing is based on the idea that Arlen Specter can and will win the 2010 election and continue to be Senator Specter and therefor of some interest. This is hardly assured by any measure. Somewhat more than a year ago An Italian company that makes Internet-based games, Molleindustria, release a web-based flash game named Faith Fighter. Of the course of time the game, which depicts religious figures and deities fighting each other, was played by millions of players on the Internet. As could be fully expected, any game that portrayed God, Jesus, Buddha, Ganesha, Budai, and Muhammad beating the holy crap out of each other generated a certain amount of ire and complaint among the various religious communities. This was no surprise to Molleindustria or anyone who had played the game. It was also of little concern to Molleindustria or anyone who had played the game since freedom of speech and expression is guaranteed in the Civilized World. Then the Islamists of the Organization of The Islamic Conference (OIC) got wind of Faith Fighter. Very quickly they issued strong complaints and demanded that the Internet service providers who are hosting the game to take immediate action by withdrawing it from the web. Molleindustria was essentially forced, under threat of loosing their hosting at the very least, to remove Faith Fighter from their site. As I’ve posted before, I will fight the Islamists’ white collar jihad with my voice, my vote, and – if needs be and the Devil will out – my attorneys. If they want to take it beyond that, I have developed a fondness in recent times for the M24A3 chambered for .338 Lapua Magnum – much more punch than my old .300 Win Mag and lighter and very much more accurate than my old, but still loved to this day, M82A1 – which should solve for most “problems” within 1200m or so. Most if not all people in America are familiar with the Miranda Warning aka Miranda Rights that are required to be given by police to criminal suspects in police custody, or in a “custodial situation,” before they are asked guilt-seeking questions relating to the commission of a crime. No incriminating statement by a suspect can, under law, constitute admissible evidence unless the suspect was advised of his or her “Miranda rights” and made a knowing, intelligent, and voluntary waiver of those rights. These Miranda warnings were mandated as a result of the June 13, 1966 United States Supreme Court decision – Miranda v. Arizona – as a means of protecting a criminal suspect’s 5th Amendment right to avoid coercive self-incrimination. That was then, and it is still that way now, but President’s Obama’s administration would like that not to be the future, and they’re willing to use the weight of the US Justice Department to attempt to do so. The Obama administration, claiming that the right to have an attorney present during questioning “serves no real purpose” and offers only “meager benefits,” wants to overturn the previous SCOTUS rulings and limit the requirement that police do not initiate questioning of a defendant who has a lawyer or who has asked for one unless the attorney is present. WASHINGTON � The Obama administration is asking the Supreme Court to overrule a 23 year-old decision that stopped police from initiating questions unless a defendant’s lawyer is present, the latest stance that has disappointed civil rights and civil liberties groups. While President Barack Obama has reversed many policies of his Republican predecessor, George W. Bush, the defendants’ rights case is another stark example of the White House seeking to limit rather than expand rights. The case at issue is Michigan v. Jackson, in which the Supreme Court said in 1986 that police may not initiate questioning of a defendant who has a lawyer or has asked for one unless the attorney is present. The decision applies even to defendants who agree to talk to the authorities without their lawyers. Anything police learn through such questioning may not be used against the defendant at trial. The opinion was written by Justice John Paul Stevens, the only current justice who was on the court at the time. Seeking to assure that the right to counsel is not lost during police interrogation, the Court ruled in Jackson that, once an accused has claimed that right in court, any waiver of that right during police questioning would not be valid unless the individual initiated communication with the officers. Overturning Michigan v. Jackson would be a huge mistake and a crime against American freedoms. So will they create a new Miranda warning? One that more accurately reflects the strictly limited and curtailed rights of suspects and defendants in police custody? Would anyone care to estimate � or even hazard a guess – what the hue and cry over this would have been if President Bush, had tried this? The Liberals� media would have decried his assault on civil liberties from coast to coast. The ACLU and other groups would have staged protests in every American city, which – unlike the Tax Day tea Parties – would have been extensively and positively covered by what passes for journalists these days. They would have called President Bush a Nazi fascist for denying legal counsel to people under police interrogation. But with President Obama in the White House, the American media is conspicuously silent on the matter. The only mainstream media outlet carrying the story was The Telegraph which is a British newspaper! I’m afraid that Reflections From A Murky Pond suffered a severe software problem. This resulted in the loss of some posts and comments. Thank you all for your patience, and my apologies for any inconvenience.